Hello. Welcome to my web site. My work delves into that magical, whimsical realm of the artist as interpreter of the human experience. I use art as a type of icon to depict that place where humans, animals and spirits come together in the natural world around us. The forms in my work are simplified and stripped to their bare lines, often abstracted and combined with a variety of symbols which make up my visual vocabulary. Each piece is an object that often combines materials of natural energy such as wood, metal, stone and clay. 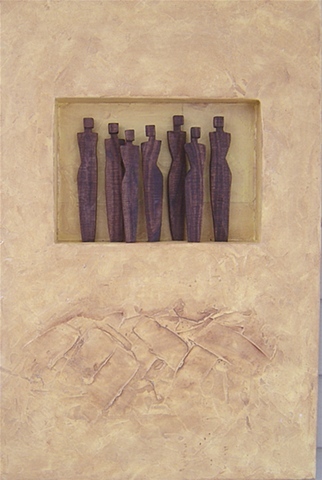 My wall pieces act as windows or portals into a world of myth and mystery. I see my work as a struggle to depict the world around us, both seen and unseen. Wayne Francis was born in 1949 in Northern Pennsylvania. He received a B.S. degree from Mansfield University and an M.A. degree from Northern Michigan University. He also studied sculpture at Portland State University. Francis taught high school in Hawaii and furniture making at Northwestern State University in Louisiana. He was the Director of the Art Museum and Cultural Affairs program at Northern Michigan University from 1986 to 2007. He and his wife Isabel then sailed their boat from Lake Superior to the southern tip of the Bahamas. They now split their time between Marquette, Michigan and Pine Island, Florida where he pursues a career as a full-time artist.